Before the last day of the regular school year concluded on June 6, Ahlhorn and Barnes had distributed more than 100,000 gently used books among 24 HISD elementary schools through Books Between Kids, thousands of which were donated by other students from Briargrove, Condit, River Oaks, and West University elementary schools. 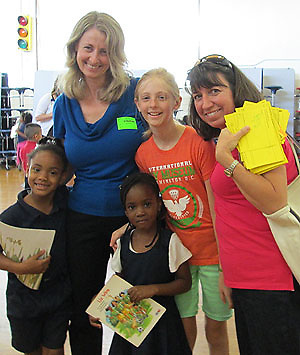 Barnes was particularly excited by the way some recipient schools have been empowered to conduct book drives of their own or to enlist the aid of fifth-graders, who act as personal shoppers for the younger students. Each student at a recipient campus could take home up to six books. Sidebar: Books Between Kids is still desperately in need of free warehouse space in which to store and sort its donations. If you are able to provide it (at no charge), please send an email to booksbetweenkids@yahoo.com.